The French love their MacDo! Si, si, hélas! We just came back from having Phở (a Vietnamese soup with meat/seafood (but when seafood, then it's not called a Phở)) for lunch and as we were slurping through our rice noodles and broth, we realized that it was cheaper (and healthier !) to have a large bowl of Pho (served with bean sprouts, Thai basil, onions, chilis, etc) than having a Cheeseburger & Fries at a local MacDo. That reminded me about a post I read a few days ago. Although it is in French and most of you might not understand it (sorry), I thought it was worse sharing with you. 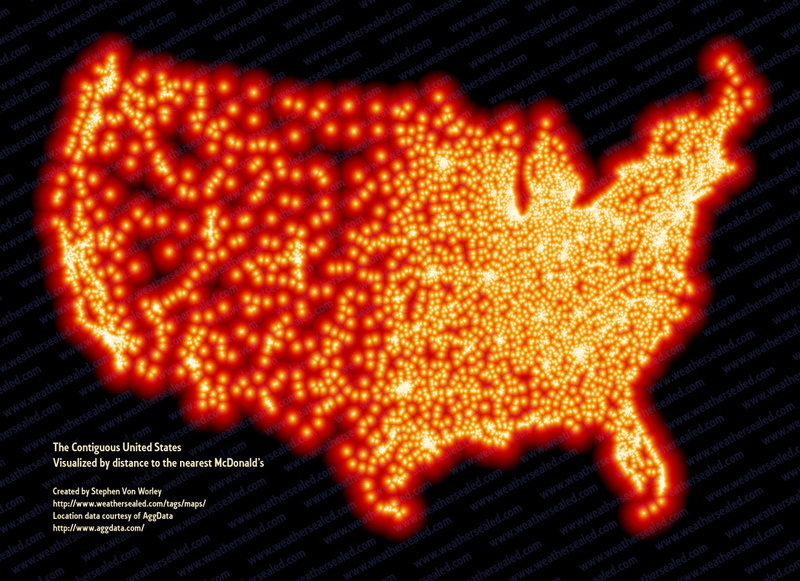 The first picture (above) shows the density of MacDo in the US. The second one (right) is the same but for France. Worse to read (at least to me) is that there are actually more MacDo restaurants in France than in the US (1,77 fast-food restaurants per 1 000 km2 in France, against 1,3 in the US). Sure enough, the US being so much bigger than France (Texas alone is 1 1/4 times bigger than France), as the first picture showed, there are places in the West of the US where density is scarce. 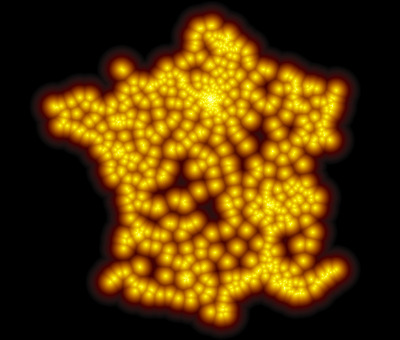 It would have therefore been more accurate to compare a part of the US that would look more like France as a whole... Anyhow, that does not explain why the Pays de la Gastronomie loves their hamburgers so much! And yet, a few years ago, as France was embracing a national-wide awareness campaign about bad eating habits, MacDo, that was pointed at, launched their own campaign. The basic message was that Eating at MacDo once a week was OK. I thought it was really clever because they were targeting two populations 1) The people who come often : for them they were warning them that it would be best for them not to come more than once a week 2) The people who never go to MacDo, hinting at them that they could come to MacDo once a week and be OK... You could also understand it this way: the food you eat at MacDo is not bad, it's your eating habits that might be!! Sure enough the Menu is slightly healthier in a French MacDo than in an American one (they even sell Organic fruit juices or Organic yogurts!!)... and sure enough, going there once a week assuming that all other meals are healthy and that the person exercises regularly (!!! ), it would not be la fin du monde.. And yes, for most people, it's an affordable lunch-or-dining option, which, on top of that, is extremely children-friendly!! That's not enough to make me go though (our lunch experience today with two young kids was just as pleasant!)... I just wished there were more places to get a Phở instead! Bon Appétit! A few years ago, together with P., the father of one of my daughter's classmate, we went to the French school headmistress to offer to start a real cafetaria. A cantine à la francaise like the ones that are so highly praised in some US newspapers... and that a lot of very high-rank people refer to in the US when trying to solve the US school meal plan disaster! See, P. was an executive chef with lots of experience in excellent multiple meals cooking, with all the network to source the best local produces and with running a kitchen from a beancounter standpoint! He had time to devote to this project and since I was also looking for something to keep myself busy while my two kids were in school, I was ready to help. We went with a full one-month menu that would have watered anybody's mouth....but long story short, this project did not go through. To the detriment of our children. To the detriment of the reputation of the school as well but there were reasons beyond our control. Tant pis. C'est la vie! And to this day, I do know that the children were the ones really loosing out, mine included since they only get in their lunchbox what I cook!! Why? Because we have been invited to P.'s place a few times and every time, we had a great meal. 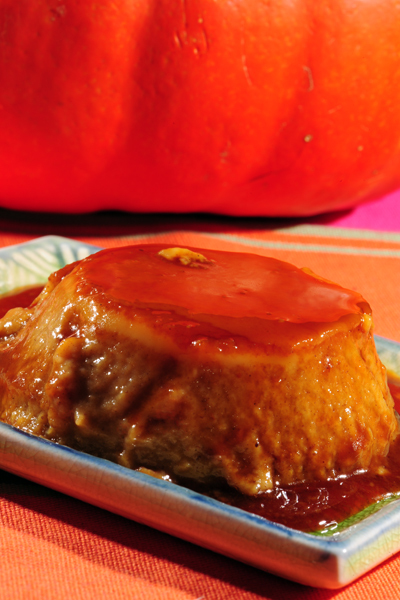 Last time we had him and his family over, he brought exquisite Pumpkin Flan au caramel. To die for (and coming from me who does not crave sweets, this says a lot). I asked him for his recipe, which he gave me with proportions for 24 servings!!! ... After a few maths calculations (argh...why did I wrongly assumed that professional cooks in the US used the metric system??? ), came up with enough to make for my family and neighbor. Since I had only glanced through the recipe, I had wrongly assumed that the canned pumpkin had to be the "PIE" type... but nobody complained that it was too sweet (that's a foreign concept for my husband!!).... 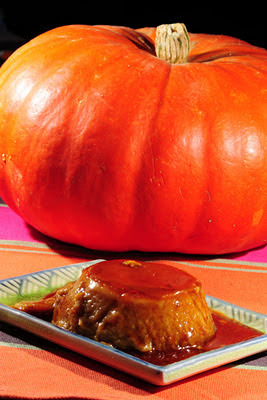 It was, admitely, excellent and something great to serve in the Fall in the US to go beyond the traditional pumpkin pie! I am so thankful that P. was willing to share his recipe. I can't wait to have another dinner at his place (or a potluck party at ours!!). At least, we know that we are not missing out! 1) Bring cream and milk to a bare simmer in a 2-quart heavy saucepan over moderate heat, then remove from heat. Whisk together whole eggs, yolk, and remaining sugar in a large bowk until combined well, then whisk in pumpkin, vanilla, spices, and salt until combined well. Add hot cream mixture in a slow stream, whisking. 2) Pour custard through a fine-mesh sieve into a bowl, scraping with a rubber spatula to force through, and stir to combine well. Pour custard over caramel into dish, then bake in a water bath until flan is golden brown on top and a knife inserted in center comes out clean about 1 1/4 hour. 3) Remove from the oven and place in the blast chiller until 40 degrees F. or less. I did not have foil cups so I used my small ramequins. Truth is that it would be easier (and prettier) to unmold if in foil cups. If you don't have foil cups, bring a little bit of water to a boil in a large saucepan and let the ramequins sit for a few minutes to melt the caramel before unmolding. No blast chiller in our house!! I just put the flans in the fridge once they were cold; if you live in a cold area, just let them cool fast outside before putting them in the fridge. I used almond milk too to lower the fat content and it turned out great too.